We managed to do it again--cram 10 people aboard our boat and consume mass amounts of turkey and pie! This year's preparation was surprisingly easy. In fact, I'm fairly confident that I didn't actually do anything. 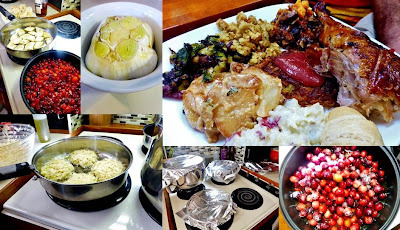 I remember roasting a head of garlic (which requires almost no effort) and then making the cranberry compote (which also requires almost no effort), but that's about it. The secret to our stress-free Thanksgiving? We outsourced turkey production! This was key, as our galley contains only one microwave-sized oven and a stove with only 3 working burners. A few Hanukkah-inspired dishes made their way onto the menu in honor of the never-to-occur-in-our-lifetime-again phenomenon known as Thanksgivukkah. 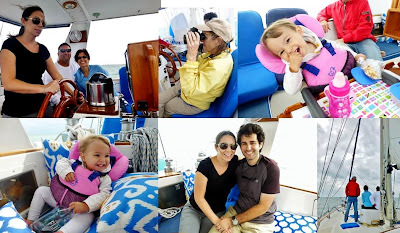 After it was determined that the wind would not, in fact, roll our boat, everyone enjoyed the sail--especially Helina.